Yip (Ip) Man’s real name was Ki Man. He was a native of Fo Shan in Kwangtung. He was the second child born in the family, living on Fook Yin Road in the Mulberry Gardens of Fo Shan. His is a well-known family in that area. Next door to his house is a famous tea room of Fo Shan, Tou Yun Gue. Also next door is a famous bakery, Gow Hing Long. The houses of Mulberry Gardens are very big, and Mulberry Gardens itself is very large and well known in Fo Shan. I was born in Hong Kong and grew up there. My mother was Yip Man’s sister. During World War II and the Japanese occupation of Hong Kong, I went to Fo Shan to live with my uncle in Mulberry Gardens. At that time, I met and studied with my uncle every day. My mother regularly told me stories of Uncle Yip’s great boxing accomplishments. As a youth, this inspired me, especially in view of the difficult time in which we were living. During the early years of the Chinese Republic, Fo Shan had a yearly festival called “Autumn Scenes.” One year Yip Man and his wife went to see the festival. While there, an officer of the military tried to take advantage of Mrs. Yip. At the time, Yip was wearing a long gown with cloth shoes. His stature was not tall, and he looked more like a gentleman than a fighter. The officer figured he was weak and helpless, so he became more daring and offensive. My uncle immediately resorted to the “simultaneous attack and defense” technique of Wing Chun, and the officer was knocked to the floor immediately. The officer then took out his revolver, but uncle grabbed its barrel and used the strength of his thumb to break the trigger, rendering it useless. 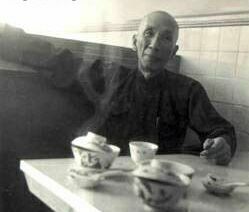 When the Japanese occupied Fo Shan, the military police caught wind of Yip Man’s reputation and invited him to become their coach. But he refused from the standpoint of righteousness. That angered the Japanese greatly, to the point that they ordered another kung fu master, surnamed Leung, to challenge Master Yip Man. Yip Man accepted only after being asked many times. Master Leung thought his punch very powerful and used it against Master Yip. Yip Man immediately executed the Wing Chun “Horse Stance and Kwan Sao” to defend himself, and then turned around and kicked Master Leung to the ground. After this occurrence, Yip Man left Fo Shan due to the increased pressure the Japanese placed on him. However, he still continued helping the Chinese government suppress the Japanese. After the Japanese resistance, Uncle Yip did not teach Wing Chun, but worked at the police department. In order to rid the area of evil and protect the people, Master Yip solved many crimes, including the Fo Shan Sar Ton Fon Street Robbery, and caught the robber in Sing Ping Theater. Master Yip Man continued his position as leader of the military patrol of south Kwang Chow until the collapse of Mainland China. With the mainland lost, my uncle left Fo Shan for Hong Kong. There he was introduced to Mr. Lee Min, who later helped Yip establish a Wing Chun school at the Mess Union in Da Nan Street, Kowloon. At the beginning, the followers were Lee Min, Leung Chan, Lou Yue, and myself. We had no more than ten students. Mr. Lee is not only a student but also a good friend with my uncle. Later on, Shu Sun Tin and Yip Bue Shing also followed uncle. The students kept increasing to the point that in 1954 Master Yip Man left the Mess Union to establish a kung fu institute at Hia Ten Street, Deep Water Bay, Kowloon. The other students and I followed as usual. At that time, uncle had to leave two or three times a week in order to teach the students of a union at Holly-wood Road and Tai Wong Temple at Queen’s Road, East Wanchai. The students kept increasing, so uncle moved the institute from Hia Ten Street to Lee Da Street to Lee Jenwou Village to Hing Yip Building. But he did not openly advertise for students. One would have to be introduced or know a follower. Bruce Lee was introduced by Mr. Cheung Jwo Hing to learn Wing Chun when the institute was at Lee Da Street. The way of Yip Man’s instruction depended on every student’s degree of knowledge, natural ability, personal habits, and interests. Yip Man’s great innovation was to personalize instruction by making each student’s progress dependent on his own habits and will to succeed. The strength of Yip Man at over seventy was no less than that of a young man. About nine years ago, robberies occurred frequently in Hong Kong. One night when Yip Man was taking a walk, two thugs with knives tried to rob him. It only took Yip Man a few kicks to knock them out of the way. My uncle encouraged me in 1956 to travel to Taiwan and establish a Wing Chun clan there. Also, I received sponsorship from President Chiang Kai-shek in this regard. I was then representing the young people of Hong Kong. I began to miss my home in Hong Kong and tried to return, but my uncle scolded me for coming back. Yip Man thought it was too great a chance to pass by. In 1960, my uncle commanded me to make my permanent home in Taiwan, and I have remained here ever since then. I returned to Taiwan to serve my country by enrolling in a military school and learning the art of war as a field commander. I am the only licensed Wing Chun sifu in Taiwan, and have as one of my students President Chiang Kai-shek’s grandson. Now that I think about it, I realize Yip Man’s intention in sending me back to Taiwan was that I should devote myself to this country and keep Wing Chun kung fu prospering here. His wish is today being fulfilled, for there are French, American, English, South African, Australian, East African, German, Israel, Canada, Poland, Belgium, Saudi Arabia, Turkey, Thailand, Norway, Hungary and many others students learning here. During the Asian and World Kung Fu contests, the members of the Wing Chun sport team have received the high honors, thus helping the Wing Chun style to prosper around the world. Because of my obligations in Taiwan, I was unable to attend my uncle’s funeral. What the people outside our area have never learned is that the authentic disciples of Yip Man, such a s myself, were the only ones entitled to wear the black band of mourning around their waists. Indirect students, such as Leung Ting, were entitled only to wear black bands around their arms. Since the death of Yip Man, confusion has continued to expand related to all matters associated with Wing Chun. I have chosen to respect the traditional Chinese ethic and my uncle’s memory by avoiding argument and conflict with all those people who claim to be the new head of Wing Chun Clan. My uncle taught that Wing Chun is not for sale. Students may apply for lessons, and each student can make his own decision about which exponent teaches the boxing most suited for him. Kai Sai earned a full teacher’s license from me, the first I ever issued. I have relied upon him since he left Taiwan to teach the Wing Chun that I learned from my uncle.